White and brown football featuring signatures of the 1977 Los Angeles Rams. Autographs include Hall of Famers Tom Mack and Joe Namath; also Pat Haden and Vince Ferragamo. 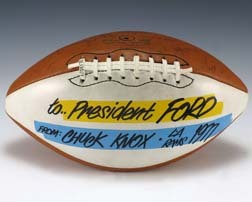 Inscription reads, “to..President Ford / from: Chuck Knox LA Rams 1977.” Full list of signatures includes: Chuck Knox, Joe Namath, Tom Mack, Pat Haden, Vince Ferragamo, Rich Saul, Carl Ekern, Terry Nelson, Larry Brooks, Jim Jodat, Billy Waddy, Jack Reynolds, Monte Jackson, Wendell Tyler, Rod Perry, Glen Walker, Rafael Septien, Dave Elmendorf, Jim Youngblood, Doug France, John Williams, Freeman Johns, Greg Horton, Harold Jackson, Fred Dryer, Cullen Bryant, Lawrence McCutcheon, Jackie Wallace, Pat Thomas, and (three unidentified signatures).